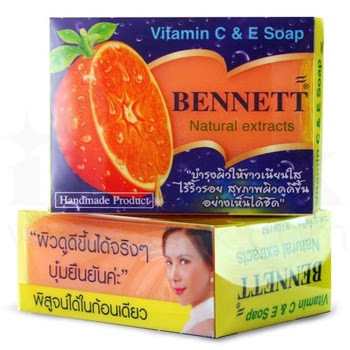 BENNETT Natural extracts (Vitamin C & E Soap) Size : 130 g Quantity : 1 item Ingredian : Natural soap, Glycerine Vitamin C , Orange rind oil, Herbal oil, Vitamin E . Usage :Wash your face or clean your skin without any scratches. Apply twice daily on the whole face on perfectly cleansed skin. Avoid eye area!! Benefits : The 1 st brightening BENNETT Soap give complete shine control. With Vitamin C & E , it formula helps keep skin looking sweat-free while reducing eccess oil. acne Acne,Dark spots and Surface - How to treat it!! Measurable lightening result : Enriched with Orange extract , from 1st application it brightens skin tone while minimizing marks and dark spots appearance for lighter skin week after week.